We have beautiful Y necklaces in our collection with pendants. Combine it with a minimalist necklace or choker. A must-have piece of jewelry that every woman needs. Do you have questions about the choker necklace with coins and Y-Lariat? Feel free to send us a message. This Y lariat necklace has two feather pendant. 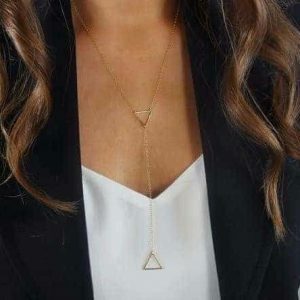 Combine the minimalist necklace with other necklaces for a layer effect. Wear it together with nice feather stud earrings or with beautiful subtle bracelets. Upgrade your outfit with this necklace. 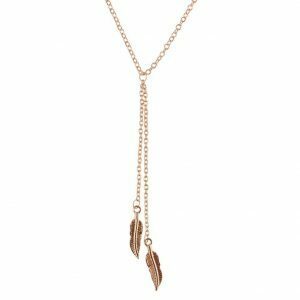 Do you have questions about the minimalist Y-lariat necklace with two feather pendants? Send us a message. This y necklace is the perfect piece of jewelry to give your outfit a boost. There hangs two beautiful leaves pendants. Complete your look with stud earrings in the shape of a leaf. Or with a beautiful minimalist bracelet or stylish ring. 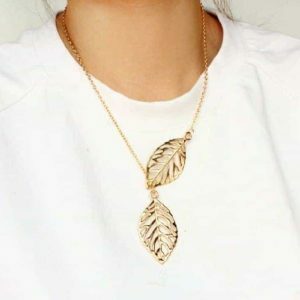 Do you have questions about the Y necklace with leaves? Feel free to send us a message. Complete your look with this Y necklace! This Y necklace has 2 nice pendants in the shape of a feather. The great thing about the necklace is that you can easily combine it with other nice necklaces. For example with a minimalist necklace or with a double necklace. This is how you make your own neck party! Also wear feather stud earrings or a nice subtle ring. Do you have questions about this y necklace with two feather pendants? please send us a message. The y-necklaces are necklaces in the shape of the letter Y. 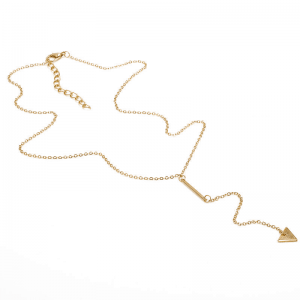 This lariat necklace is especially gold when you’re wearing a V-neck t-shirt. The minimalist style makes it look elegant and modern. These necklaces are available in the colors silver, gold and rose gold. We have Y necklaces with various lovely playful pendants. create layers. The perfect accessory for the modern woman who wants to look good. With a long necklace you can create different looks. Combine your long necklace with your new y necklace. These necklaces look great with a basic t-shirt, a nice blouse and even with a dress. Are you fond of experimenting with jewelry and looks then buy a beautiful timeless long necklace. We have boho necklaces for bohemian chicks. On the other hand, we also have pearl necklaces that provide a chic look. For the women who have a lot of guts, there are necklaces with large pendants. Most of the necklaces that we have in our collection look unique. If you have no idea what kind of jewelry you should wear to work, you can always go for a nice necklace. It fits almost every outfit. If you wear a piece of jewelry from Aphrodite you can certainly expect compliments. Combine your new y necklace with other nice jewelry from Aphrodite. 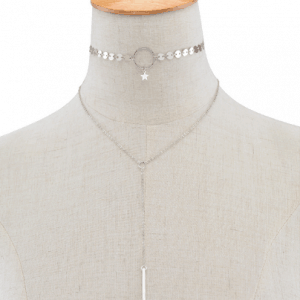 We have beautiful double necklaces that you can wear with your Y lariat necklce. The double necklace with coins is very popular. We also have other beautiful jewelry in our collection. A nice choker should certainly not be missing in your jewelry collection. The choker necklaces from Aphrodite are available in the colors silver and gold. You can also combine your new y necklace with the cool chain earrings. These earrings with chain are available in the colors silver and gold. Also the minimalist earrings should certainly not be missing in your jewelry collection. We have trendy earrings that are small but nice. Also the heart and star stud earrings should not be missing in your jewelry collection. The y lariat necklace will also look nice in combination with beautiful fine bracelets. Combine your new minimalist bracelets with beaded bracelets for an arm party. We also have beautiful statement bracelets that will give your outfit a boost. Wear your new arm candy separately or next to a watch. Last but not least! wear your y necklace together with a nice ring from Aphrodite. The initial ring is very hot at the moment. Available in the colors silver and gold. Wear several nice rings together for a ring party. Be sure to take a look at the ring sets category. There we have beautiful ring sets with 3, 4, 5 and multiple rings. Also take a look at the scrunchie and anklets category. Subscribe to our newsletter so you will be informed when we add new y necklaces to our collection. Follow us on facebook and instagram too! we regularly have nice competitions there.